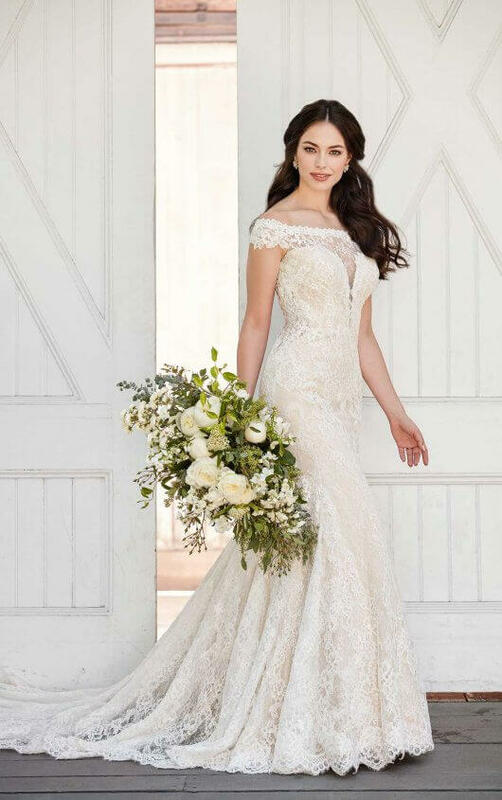 Lace and tulle over matte-side Lavish satin creates a relaxed column silhouette that feels casual while remaining true to classic bridal style. The low back is complemented by a lace cage train, which only adds to the uniqueness of this dress. Modern linear lace drapes down the skirt while embroidered lace throughout the bodice hugs a bride’s curves in all the right places! Off-the-shoulder lace sleeves add a trend-worthy touch. This backless wedding dress zips up under fabric covered buttons.